Gazania are the go to plant for drought tolerant landscaping with flowers. Low growing, long flowering and very easy care. If you are looking for extra colour in a flowering ground cover plant then some of the new Gazania hybrids could be the answer. From South Africa they will reach around 25cm and do have attractive silvery green foliage. Flowers are orange, yellow, pink to red and creamy white as well as multi colored. Sun is essential as the flowers will only open fully on sunny days. Drought tolerant, sun loving, low growing and matt forming they really do make a colourful show from spring through summer. Gazania ringens is called the treasure flower but is also known as the African Daisy, reaching around 20cm in height in good conditions heat and drought tolerant and with dozens of colorful hybrids widely avaialble. They like the sun so much that the flowers will actually ‘close up’ on heavily overcast days. As long as you have a sunny position and a free draining soil Gazania will grow happily. They require little care, however in very dry periods they will benefit from some additional water. Plants can easily be propagated by division of larger clumps. 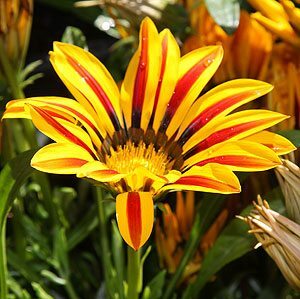 One of the main problems with Gazanias is overwatering and over fertilization, they do like dryish conditions, and are happy in poor soils. They grow well in a container where they will quickly fill it and spread to flow over the sides. easily pruned back to maintain shape. Plants can be propagated from seed (plant in spring), cuttings or by root division. Very useful plants for difficult situations. They are also useful in erosion control and can be grown in containers to underplant taller plants.